More time is only good if it’s used for something. The success of the Greek debt swap this week staved off chaos but is not a solution to Europe’s problems or a signal that an end to the crisis is in sight. Recent weeks have seen a growing awareness of the accumulation of imbalances in Europe’s central payment system, TARGET. These imbalances are yet another reflection of the fundamental asymmetries at heart of Eurozone crisis and are analogous to build ups that destroyed the Bretton Woods system. The commentary and debate on TARGET is currently overly technical. This post explains and analyses the nature and origin of these imbalances, and asks what they mean for the Eurozone (for some background on the link between budget and current account deficits see here and the crisis in general here, here and here!). TARGET is an acronym standing for Trans-European Automated Real-Time Gross Settlement Express Transfer. Fog lifted?! It’s basically a system through which commercial (‘normal’) banks in one Eurozone country make payments to commercial banks in other Eurozone countries. Importantly, TARGET balances can be interpreted as a measure of the accumulated deficits and surpluses in each Eurozone country’s balance of payments with other Eurozone countries, reflecting the amount of ‘extra’ money circulating in a country over that created inside the country by it’s own national central bank. Until mid 2007, TARGET balances netted out at zero; there were no deep asymmetries in financial flows within the Eurozone. This is no longer the case. Prompted by the financial crisis, imbalances in the TARGET system have ballooned. This is shown in the graph below, taken from Sinn and Wollmershaeuser (2011) (GIPS refers to Greece, Ireland, Portugal and Spain). TARGET imbalances have gone under the radar because they do not show up on the ECB’s balance sheet. However, this is not to say they are inconsequential. Researchers have commented on the similarities in the imbalances captured by the TARGET balances and those that destroyed the Bretton Woods system. Therefore, understanding what these balances reflect, how they have arisen and how to fix them is of crucial importance. Let’s build up how these imbalances have arisen in stages. To understand the full story, we need to look at how payments are made between banks. When customers make transfers between commercial banks, in effect, it is actually central bank money, or ‘base money’, that actually flows between them. Consider a Greek factory owner wanting to buy a new machine. If she buys from a vendor within Greece, funds need to be transferred between bank accounts within the same country. To affect the transfer, base money is taken out of the central bank account of the purchaser’s bank and put on the central bank account of the vendor’s bank. The purchaser’s bank then charges the checking account of our factory owner, and the vendor’s bank credits the vendor’s account with the payment amount. If our factory owner instead buys from a machine vendor in another country, say Germany, a similar procedure occurs but payments now flow via the Target system of the European Central Bank (ECB). When the Greek National Central Bank (NCB) debits the account of the commercial bank of our Greek factory owner, it takes money out of the Greek economy and sends a payment order to the Bundesbank. In so doing, it acquires a liability to the ECB. On the other side, the Bundesbank creates new money and transfers it to the German producer’s commercial bank, acquiring a claim on the ECB. Target balances reflect these liabilities and claims on the ECB. Until 2007, payments between countries cancelled out as they flowed in both directions. This is despite the huge asymmetries in intra-Eurozone trade because importing countries paid for their imports with foreign money received from asset sales to exporting countries. Thus, private capital flows financed trade flows. Target imbalances have arisen because trade and asset flows no longer net out at zero, causing a build up in claims and liabilities. A Target deficit represents a net outflow of money to pay for an inflow of goods, and a Target surplus can be thought of as an accumulation in a stock of ‘outside money’ within a country. Target balances are best thought of as loans given that they reflect the fact that economic goods are moving between countries without movements of goods or other assets in return. They represent real claims and liabilities on the ECB. To affect our machine payment transfer, the Greek NCB destroyed money without its assets becoming any smaller and in so doing acquired a liability to the ECB. This Greek Target liability can thus be thought of as a public debt provided to the country by the Eurozone. 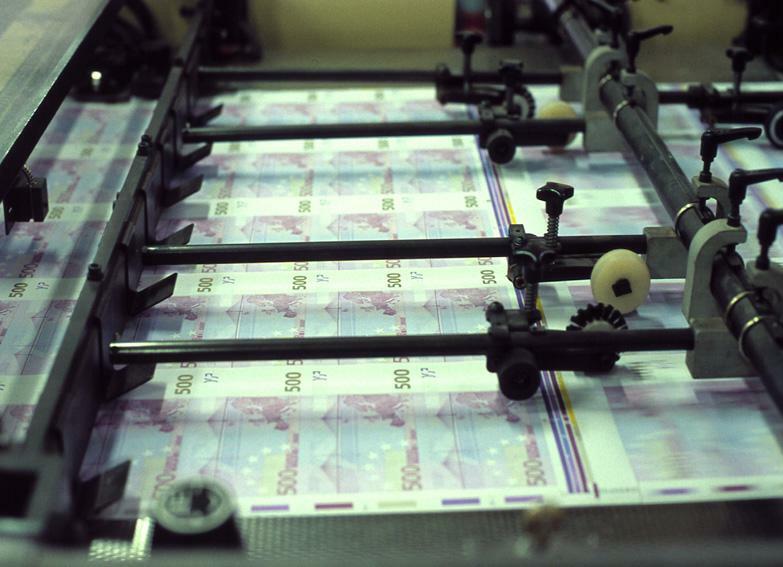 On the other hand, the Bundesbank created money without actually receiving any tangible assets from commercial banks. The Target claim it acquires compensates for that and thus can be thought of as a public credit given to the Eurozone, allowing recipients to buy foreign goods. To get at the full picture, we need to add another level of complexity. 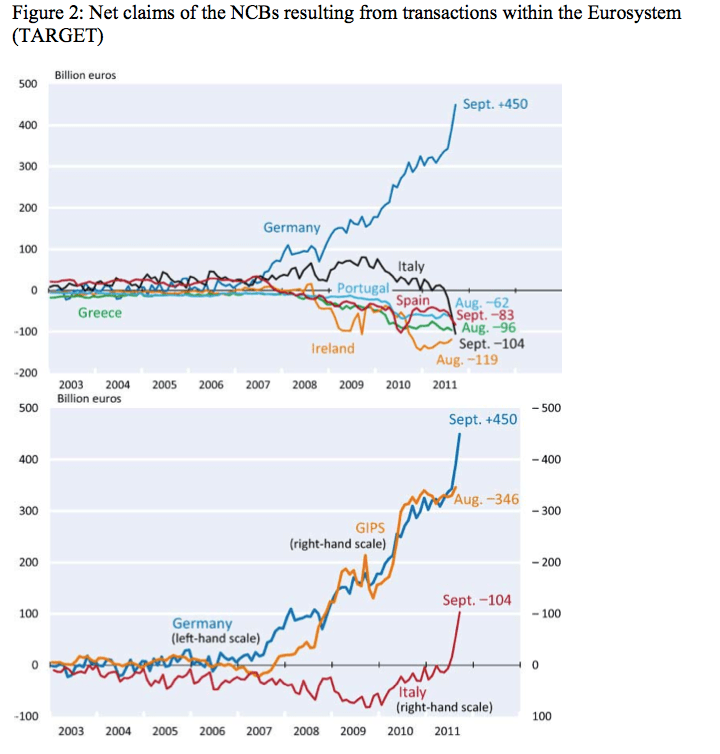 As described above, Target balances shift money from Greece to Germany. 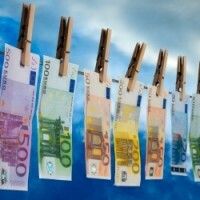 The Greek NCB destroys money when a payment request to buy the German machine comes in, and the Bundesbank creates money to wire to the vendor’s commercial bank in return. If this was the end of the story, there should be no money left at all in Greece. Their coffers should have been emptied long ago. Yet, the monetary base of periphery countries has actually grown slightly since the start of the crisis. What is going on?! The money flowing out of the periphery countries via international transactions has been fully offset by the creation of new money by their NCBs. In effect, these NCBs have been issuing new money as a form of credit to finance the purchase of foreign goods, taking the place of the private credit that was free flowing before the financial crisis. Likewise, in Germany, we should have seen an explosion in the monetary base given that the payment process demands the Bundesbank creates new money and this new money has not been used to purchase foreign assets. No such explosion has occurred. German commercial banks have not needed all the additional money flowing into them and thus have either reduced the amount they tend to borrow from the Bundesbank or have placed the unneeded liquidity at the ECB to earn interest. Therefore, we have witnessed a huge shift in refinancing credit from Germany to Greece without any change occurring in the monetary base of these countries. This credit reallocation represents a capital export from Germany to Greece, a loan given by the Bundesbank to periphery countries, enabling them to buy more German goods than would otherwise be the case. In theory, given sufficient appetite, peripheral and core countries could go on swapping Target claims for real goods indefinitely, with imbalances becoming more entrenched over time. However, this is unsustainable. These imbalances reduce the ability of the ECB to influence the Eurozone economy and preserve and perpetuate the structural asymmetries at the heart of the crisis. Given that Eurozone countries, by definition, operate within a single currency union, there are no automatic mechanisms to force the system back into balance. If we want adjustment, explicit policy action to tackle the heart of the problem is called for, i.e. credible steps to harmonise structural policy and reduce the asymmetries in productivity and demand across the Eurozone. We are yet to see believable policies to this effect, especially those that would challenge German dominance. Rather, what we have seen in the last few weeks are moves by the Bundesbank to insure the €500bn Target claims it has built up against the Euro system. Given that these claims represent public loans to the periphery, they stand to loose a lot if the Euro was to suddenly collapse, some 20% of GDP in fact. The head of the Bundesbank has proposed that these claims be securitized, or in other words, he demands access to the Periphery property and asset markets to cover losses in the event of a Euro collapse. Wow. Shame we’ve already snatched the Elgin Marbles. Finally, the fact that this proposal has even been raised signals that the Bundesbank is deeply worried about the death of the Euro. For them to seek this kind of insurance, demise is still most definitely on the cards.